THE Cabinet Secretary for Justice, Kenny MacAskill MSP paid an inaugural visit to the new Ayrshire Civil Contingencies Team offices, located in Robertson Road at Glasgow Prestwick International Airport. Employees from North, South and East Ayrshire Councils, who previously worked in the Emergency Planning sections of their respective Councils, have now been formed into one Ayrshire Civil Contingencies Team. The Team was formed following discussions between the three councils about the benefits of merging this service. A Steering Group was formed to oversee the transition and future development of the service. Since December 2008 the employees have been working together. Funding contributed by the Scottish Government enabled members of the Team to relocate, refurbish their office accommodation to meet their specialised needs and to update their IT capability. After his inaugural visit, the Cabinet Secretary for Justice, Kenny MacAskill MSP said: “Working together with local authorities, law enforcement agencies and other organisations, we are committed to enabling our communities to withstand emergencies of all shapes and sizes where these cannot be prevented. We must use resources flexibly and pragmatically, and promote resilience across the public, private and voluntary sectors. “The Scottish Government was happy to assist with the start-up costs for the Joint Ayrshire Civil Contingencies Team. This new service will ensure strategic priorities in Ayrshire can be identified together and decisions taken jointly about how the vital civil contingencies specialists are deployed. The Team address all aspects of civil contingencies planning, which is governed by the Civil Contingencies Act 2004. Under this Act local authorities have been classed as a ‘Catergory 1 Responder’, giving the Council the same powers and duties as the emergency services. Each council has a statutory duty to respond to emergencies, their main role being to care for uninjured people who have been affected by an emergency incident, to assist and support the emergency services and to lead the recovery process. The aim of the Team is to ensure that the Ayrshire Councils provide a high quality and effective emergency planning service, by working to wherever possible prevent emergencies taking place. If an emergency situation does occur, the Team will make sure that all Ayrshire Councils have plans and arrangements in place to respond to and counteract the effects of any emergencies that do occur. 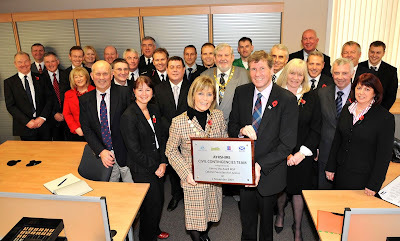 The Provosts, Leaders, Chief Executives and members of the Steering Committee from North, South and East Ayrshire Council were present were representatives from Scottish Resilience Civil Contingencies Unit, Strathclyde Police, Strathclyde Fire and Rescue, NHS Ayrshire & Arran, Scottish Ambulance Service, Maritime Coastguard Agency, Glasgow Prestwick Airport and Scottish Environmental Protection Agency. There are currently 609 Ayrshire business stories permanently archived on this site. To locate those of most interest to you, please use the site search facility in the top left hand corner of this page. Type your search term in the white box, then click “SEARCH BLOG”.